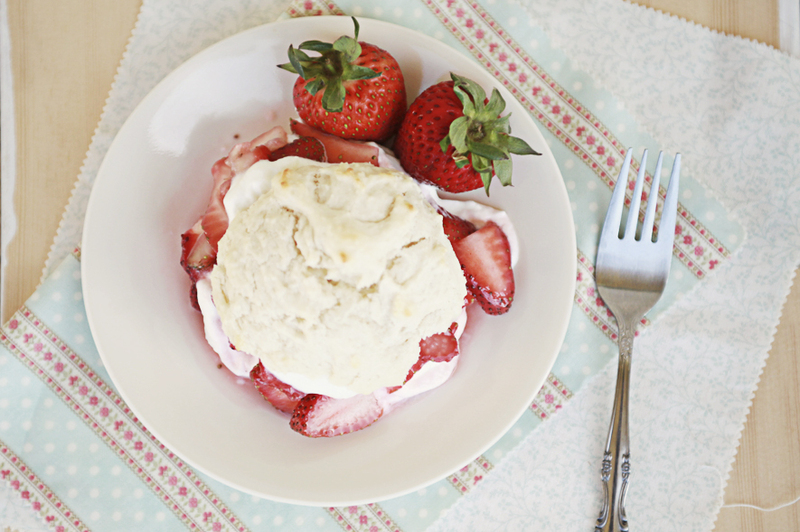 Don't Mind if I Do: Strawberry Shortcake. Could there be a cuter, more a vibrant dessert than this?? I think not. I grew up eating light and fluffy sponge cake with strawberries and whipped cream (which is really considered to be "strawberry shortcake" in Japan)...whether or not that is the true interpretation of the actual term, I still don't know. Since then I have had both cake and biscuit versions of the dessert and enjoy them both equally. This time we went with the biscuit. Crunchy on the outside but still soft on the inside. It soaks up enough of the syrup but still holds up well and doesn't get soggy. 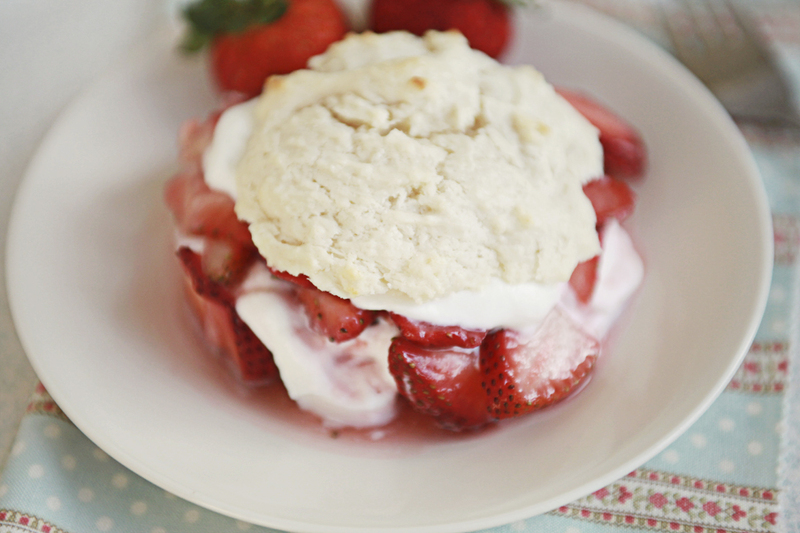 The crunch of the cookie is a nice contrast to the macerated strawberries and light whipped cream. So which is your choice biscuit or cake?? In a mixing bowl, stir together sugar and strawberries, and set aside to macerate. In a separate bowl, whisk together flour, baking powder, and sugar. Working quickly, with a fork or pastry blender, cut the butter into the flour until crumbly. Add the cold milk and vanilla and stir til combined. Drop the mixture into 4 equal parts on an ungreased baking sheet. Bake for 12-15 minutes, until golden, when in doubt, use a tooth pick to make sure it's cooked through. Let cool before serving. 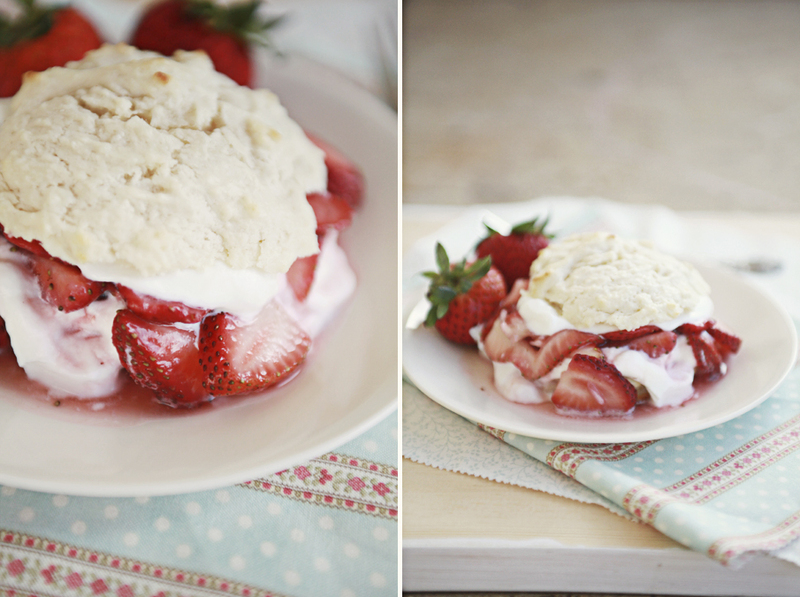 Cut the biscuit in half, spoon on strawberries and whipped cream on bottom half and drizzle with juice. Top with the other half of the biscuit and enjoy!